Naturo (Mackle Petfoods) make magic at The Ulster Grocer Awards 2018! Naturo won big and had a successful evening at The Ulster Grocer Awards 2018, being awarded Best Marketing Campaign, as well as Best Food Export Marketing, at the 30th annual Ulster Grocer Marketing Awards on April 27. 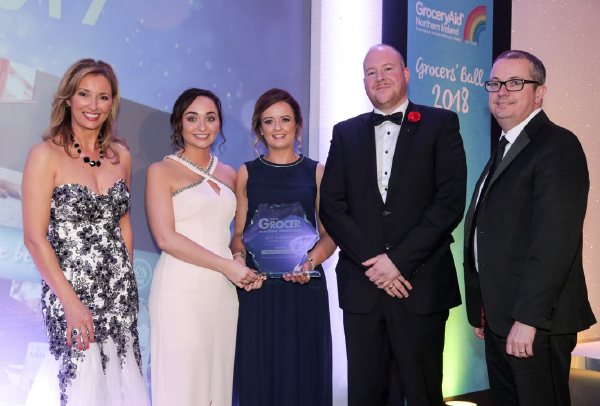 Winners and highly commended entries were recognised across nine categories during the Grocers’ Ball, an annual gala evening held at the Culloden Hotel to raise funds for grocers’ benevolent fund GroceryAid. Receiving one of two awards at The Ulster Grocer Awards 2018! Naturo were delighted to be recognised for our exporting work, as we now export to 14 countries, including Europe and the Middle East, with plans to increase this number too! Naturo were equally thrilled with bringing home the big award of the night: Best Marketing Campaign. As a company we work on our marketing efforts and are already working hard on bigger and better campaigns for our customers to see! For more info on The Ulster Grocer Awards 2018, click here.